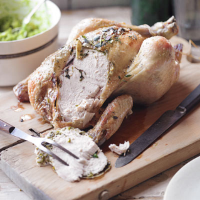 A comforting classic of roast chicken with fresh rosemary, thyme and lemon. Serve with Really Green Risotto as a delicious alternative to Sunday roast dinner. 1. Preheat the oven to 180°C, gas mark 4. Mix the butter in a small bowl with the rosemary, half the thyme and seasoning. 2. Ease your hand under the skin of the chicken at the neck opening and smear the herb butter under the skin. Place the lemon and garlic in the chicken. Rub all over with the oil, season and place in a roasting tray. 3. Calculate the cooking time according to pack instructions and roast until the juices run clear and there is no pink meat. Remove from the oven, baste and scatter with the remaining thyme. Rest for 10 minutes before carving.